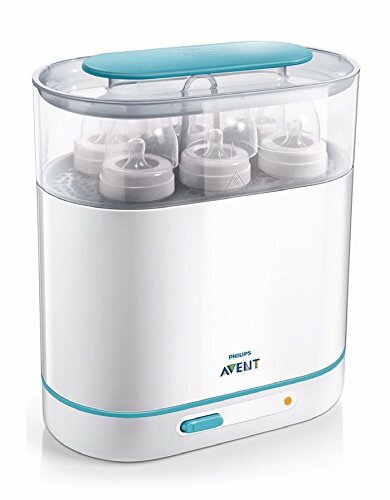 the philips avent 3-in-1 steam steriliser--the easiest way to sterilise please note: you must descale this item regularly to ensure the product still functions correctly. If you do not descale it, it may produce burning smells, cause staining on the heating element or leak. In hard water areas this will need descaling as often as every two weeks. Please see related video in the image block which shows how to descale the item. sterilising your baby's feeding equipment is one of those little jobs there's no getting away from. Forgetting to properly clean and sterilise your baby's feeding equipment can lead to tummy upset, diarrhoea and an unhappy or ill baby. kill bacteria effectively with the philips avent 3-in-1 steam steriliser click here for a larger image the philips avent 3-in-1 steriliser is here to help. A versatile steriliser that changes to suit your needs, it can be adjusted to fit the items you are sterilising, in order to take up the least amount of space in your kitchen. the steriliser has 3 sizes: ? small: the most compact configuration, perfect for sterilising soothers and small accessories such as teats ? medium: for breast pumps or toddler plates, knives, forks and spoons ? tall: the largest size, for sterilising a full load of 6 bottles and accessories fits all bottle types the sterilizer has been designed to fit both wide-neck and narrow-neck bottles as well as different breast pumps and accessories. This gives you the freedom to choose the bottles and accessories that best suit you and your baby. At full capacity the sterilizer holds 6 330ml philips avent bottles. fast and effective-sterilisation in 6 minutes with a 6-minute cycle, your bottles and accessories will be sterilised before you know it. Once sterilisation is complete, the device will shut off automatically, ensuring extra safety and less energy consumption. just add water the philips avent 3-in-1 steriliser is remarkably simple to use.